I was VERRRRRRRRRRYYYYYY excited this morning when my Kindle book delivered 🙂 So much so that I was 15 minutes late for work as I just had to start reading. I’m going to get your book on my Kindle this weekend (since the Kindle is a Christmas present that I don’t technically have yet), and can’t wait to read it! And hear you read it next month! Congratulations! I am waiting for the book to come in through Amazon. I preordered it a few weeks ago. Continued success with the book and the tour. First off, congratulations… as an author myself, I know how exciting it can be to see one’s book published. You must be over the moon right now. Anyway… just to let you know… my local library here in Ohio has 10 copies of your book ordered. Thanks Christina! It was definitely a wonderful day. And great to know about your library. so exciting! You must be so excited today…Congrats! I got an email yesterday from Amazon that my pre-order was en route. Can’t wait to start reading and see you at your reading on Jan. 9th. I loved the Post review. Keep ’em coming. They are ordering several copies for our library system, and there are currently 22 holds on it. I have put a hold on it too, so I guess I’m # 23 in line for it. Can’t wait to read it. Wow! 22 hold? That’s so exciting! Thanks for requesting it Betty! I’m stopping by my indie store this week to buy it! I feel like I’ve been waiting so long for this book – I can’t imagine how you must feel. CONGRATS! Thanks Ashley! I feel like I’ve been waiting forever too! Congratulations Rachel!!! I’m so proud of you! Let’s have a friend date soon! I would like to have a copy of this. I started listening to the audio book today – I didn’t even know this book existed, but it was featured on Audible.com! So far so good – and you have a very well designed book cover. I will resist the urge to add an emoticon as you have covered your distaste for that early on in the book. Thanks Samantha! I’m so glad you found the book. And for an occasion like this, even I warm up to emoticons. I feel like I have no choice these days! Thanks again for listening to the book — and checking out the cover. I feel so lucky to have ended up with such a well designed cover! Just finished the book, I loved every page. I sent a copy to my BFF who recently moved away and we read it together. I was most moved by your ability to find words to describe the magic of these relationships. Can’t wait for your next book, continued success. Thank you so much! 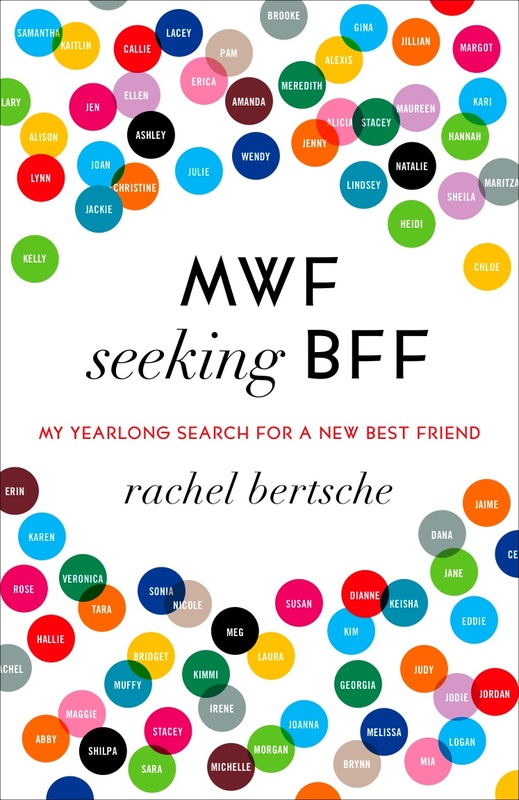 I’m so thrilled you enjoyed MWF Seeking BFF and hope you’ll spread the word. I’m especially touched by what you say about finding the words to describe these relationships… It’s so strange that there’s no real vocabulary for close friendship and making new friends, so I really appreciate the compliment! Thanks again and happy holidays! Reading your book right now. Its been a page turner because I have been going through the same thing for the past 4 years. Its nice to know I’m not the only one who feels like I am missing something in my life. Thanks Kimberly! I’m so glad you are enjoying the book. And no, you are most definitely not alone! It’s so hard, and there are so many of us in the same boat, I’ve learned. Thanks again for reading!